My wife and I spent this past week in Asheville, NC. 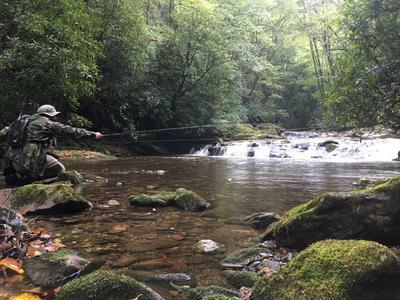 There was no way I was going to the WNC mountains without getting some fishing in. The first step was to secure a cabin with access to a stream. There were trout in it, but my warmwater ways were insufficient to entice any to strike. I did manage to lay waste to the population of warpaint shiners, mostly on a UKB, although they'd try to eat just about anything that drifted past. The next step was to see about heading into a national forest to pester the trout there. I didn't trust myself enough to try to figure it out on my own, so I looked into guides. The lone "tenkara" guide was out of the country, so after scouting around I settled on Asheville Fly Fishing Co. When I made my inquiry I closed by saying, "There's just one thing. I'll be fishing tenkara. Yeah, I'm one of those. If you're still interested..." The owner, Galen, got back to me right away and didn't seem at all put off by my crippling deficiency. Tuesday morning rolled around and I met my guide, Ryan, in a parking lot. After briefly discussing what I was looking for, we headed into Pisgah National Forest and the north fork of the French Broad River. Unfortunately the rains of the night before (and that would continue to follow us around most of the day) had made the river a bit high and murky. No reason to waste a hike, though, so we set up at the tail of a riffle where it fed into a large pool. I rigged up my Kurenai HM30R with a copper kebari, and began an across-and-down casting pattern. After about 15 minutes I felt a tap and set the hook. The Kurenai bent through the grip and began to sing. I laid the rod over to the side and began applying light pressure, thinking this might not be a catastrophe. The huge brown leapt, and the line went limp. Correction: the line went *missing*. I suspect that when the fish jumped it landed on the main line, and something had to give. In this case, that something was the micro swivel. The little piece of metal left is bent, and the first section no longer collapses fully into the second. Fortunately I'd brought four rods. Since the river was wider than I'd anticipated when I'd planned the trip, I grabbed my TB Traveler 44, which I'd packed mainly because my Zimmerbuilt pack had four slots. The overhead tree cover meant that standard casting was out, but bow-and-arrow casts worked fine. We continued to hammer the riffles, and Ryan seemed impressed by the rod's ability to deliver fantastic drifts (at least when I did my part). Sadly those drifts didn't result in any more bites, and we decided to move on. Stop two was Courthouse Creek. This was a high-gradient stream, full of plunge pools, and crystal clear despite the rain. Access was the issue here. In theory the road ran right along the creek. In practice, the creek was upwards of 75 feet below, nearly straight down through the rhododendrons. We eventually found a spot with only a high likelihood, instead of a certainty, of death, and scrambled down. I quickly decided to stick with the TB 44, despite the smaller stream. There was little room for overhead casts, but the drifts were worth it. This was not a stream that would give up trout easily. One had to climb over, under, and through everything to advance or get into position to cast. 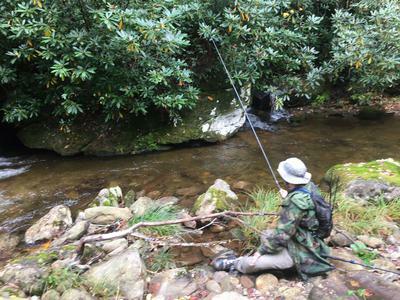 At one point I was thigh deep, tight against the bank, standing inside a rhododendron, awkwardly sidearm casting upstream and around the corner, hoping that any fish that bit would hook itself as I was fishing absolutely blind. We worked upstream until we couldn't go any further and climbed out. At that point it'd been a full day, but Ryan was still up for more. We decided to hit the Davidson River. 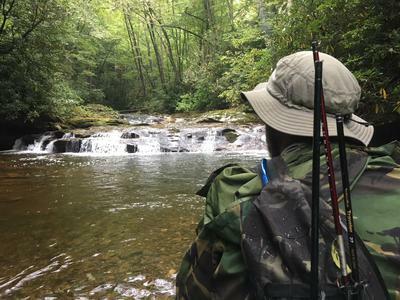 This is known both for its huge fish and its crowds, but Ryan felt that it wouldn't be too busy at sunset on a Tuesday, and he was impressed enough by a tenkara rod's ability to deliver a drag free drift that it was worth a shot. This was the most surreal water I've ever fished. We parked in the large paved lot at the fish hatchery, walked a few feet to the stairs down to the water, and were surrounded by canoe-sized wild brown trout, finning in the shallow water and occasionally sipping at something on the surface. I got some decent drifts over them, and even got a few looks, but no luck before dark. It was time to head back. Considering all the stories I've heard about guides either not knowing what to do with tenkara or just flat refusing to play along, I was impressed with Ryan's willingness to learn and make things happen. He was willing to fish out of my fly box and I was willing to fish out of his. Definitely look them up if you're down that way. I also think I may have cost Ryan some money. After his interest in my rods, I fished out one of Chris's cards from my pack at the end of the day. We'll see if we have a convert. Robert, if you are careful, you can straighten the pin on the swivel by holding the main part of the swivel very firmly and lightly applying pressure on the pin to straighten it. Make sure that you do not bend the tip section itself or the section/swivel junction. I've been trying to tweak it, but the bend is pretty subtle, and it's driving me nuts trying to get it straight enough to slide through the second section. If I can't get it right I'll be hitting you up for a replacement piece. Robert - So sorry to hear about your rod. I have experienced the pain of a broken rod! 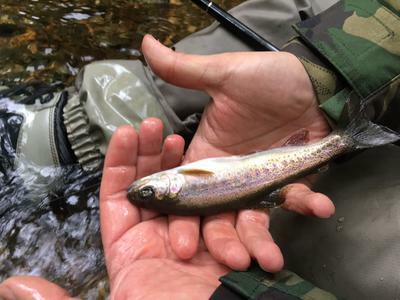 In my experience we as fixed line fisherman have brought some of the criticism of Tenkara on ourselves. I fish the Owyhee tailwaters often. I see license plates from all over the country when I fish there. Many of these fly fisherman are guided. Three times this summer, I was approached by guides to talk about my "long rod." (the Keiryu Sawanobori 63 or the Fine Power 52). We had a nice conversation about Tenkara fishing. All three ended our conversation by saying something like, "Thank you for sharing, your the first Tenkara fisherman that was willing to talk with me." That said, the Owyhee isn't a restricted fishing area. There is an unwritten rule that it is fly fishing waters. I have never gotten more dirty looks from fly fisherman than when I took my Tenyru Rayz Spectra Spinning outfit fishing! I doubt they would approve of my ultralight worm fishing with my Keiryu rods as well! Those browns and rainbows sure love red wigglers! Les - In a way I was happy that the rod broke. I'd just gotten through showing the guide how to attach a level line to the lillian, and remarked that the first time I ever did that I launched the line on the first back cast because I didn't secure it properly. Once the fish was gone and my brain started working again my first coherent (printable) thought was, "Don't tell me that the line slipped off." It was kind of nice to know that all my stuff held, and the rod was at the mercy of a big fish. I tend to agree that we're more closed off than we need be. To read about it on the internet, there's this massive, unhealable schism between fixed line and Western fly fishing. The truth is, most people likely don't care or are at least mildly curious, like the guides you spoke to. However, we're all out there to relax and enjoy ourselves. No one wants to have a run in with one of those actual screaming "purists," real or imagined. Its hard to blame our side for wanting to just clam up and move on down the river.